Well it has been a minute since I did a MANICure Monday post…I haven’t really had the time to polish my nails and I haven’t been feeling too creative either. But I had a little extra time on my hands last night plus the Nakamichi Nail Foil Strips that I were in this months My Shade of Brown Pillow Box that I posted about here, so I decided to treat my self to a little mani. Check it out…. Excuse my middle finger, it was late and didn’t get a chance to clean it up as much as I would like. 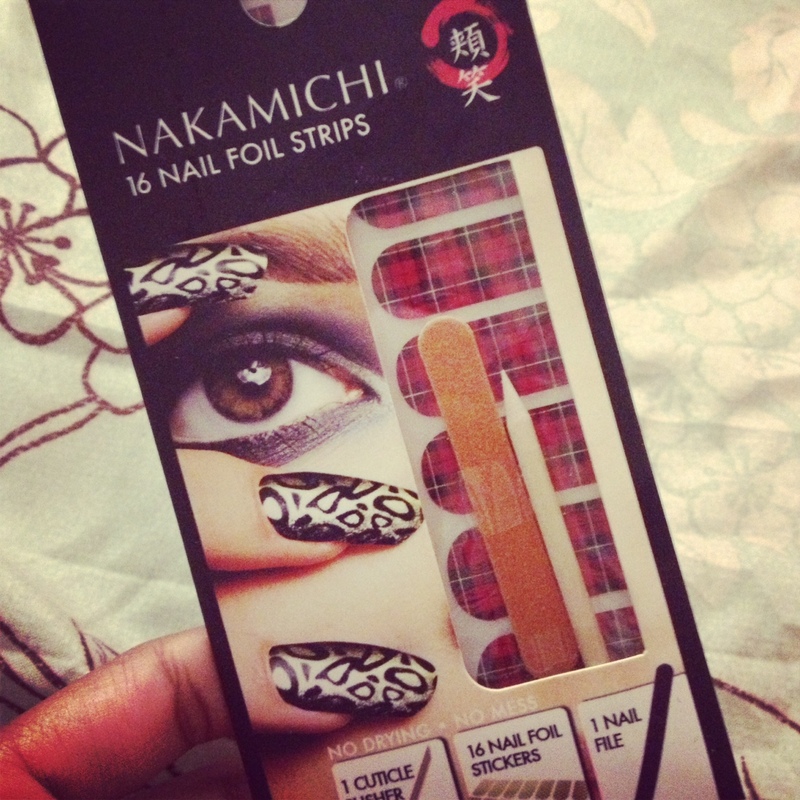 I’ll be doing a review of the Nakamichi Nail Foil Strips soon. You can join in the MANICure fun and see more fab manis by checking out Mimi from Lipgloss and Binky and Effie Lynn from LALynnsShoppe! This entry was posted in Just Another MANICure Monday, Nails and tagged foil strips, Manicure Monday, Nail Art, Nakamichi Nail Art, Wet n Wild on January 28, 2013 by Roni the Savvy Housewife. Love the way these came out! These are such a convenience! I gotta get back in the grove of things! Thanks for linking up & sharing! Thanks so much! They are convenient and fun…I love them! Those nail strips are dope. They remind me of the scotch tape label. I’m weird what can I say? I really like the look. Dang see.. now I gotta go buy some cause I haven’t used them in a while and need them!! LOL as if you need any help in creating designs…your nails are ALWAYS dope! Now why I gotta hate Chris?! LOL! I still haven’t tried nail strips…iono what’s been stopping me. I actually got a shellac mani this week so I’ll be rocking it for 2 weeks. I need to do a post about it…thx for the reminder! I thought of you and laughed when I read the name of the polish…And iono what you’re waiting on either. I love the nail art strips! I love how these came out. I never tried the nail art stickers even though I got two boxes in here. I need to try them out. Thanks! 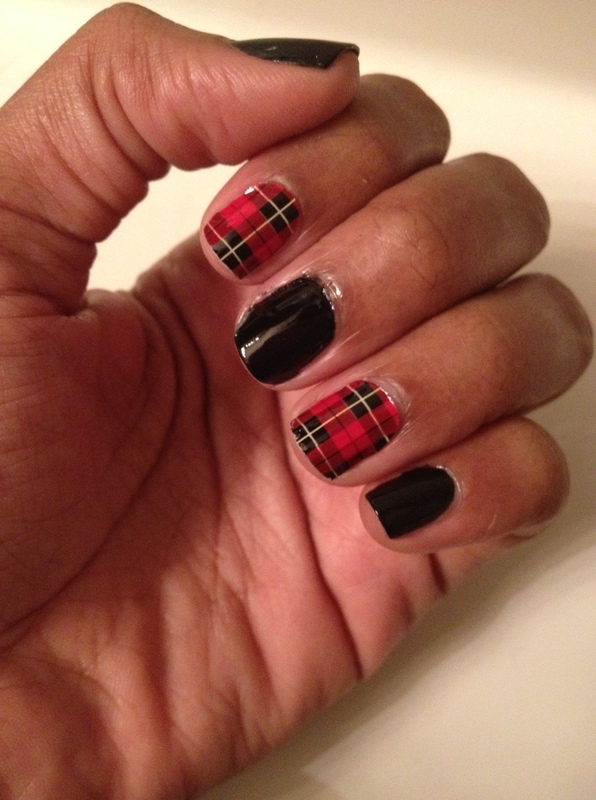 I love the nail art stickers…they are so easy to use. I love how these came out. I never tried using the nail art stickers before, even though I have two in here. I need to break open the box now. I love the nail art stikers, especially when I don’t have a lot of time. I haven’t heard of these strips before. 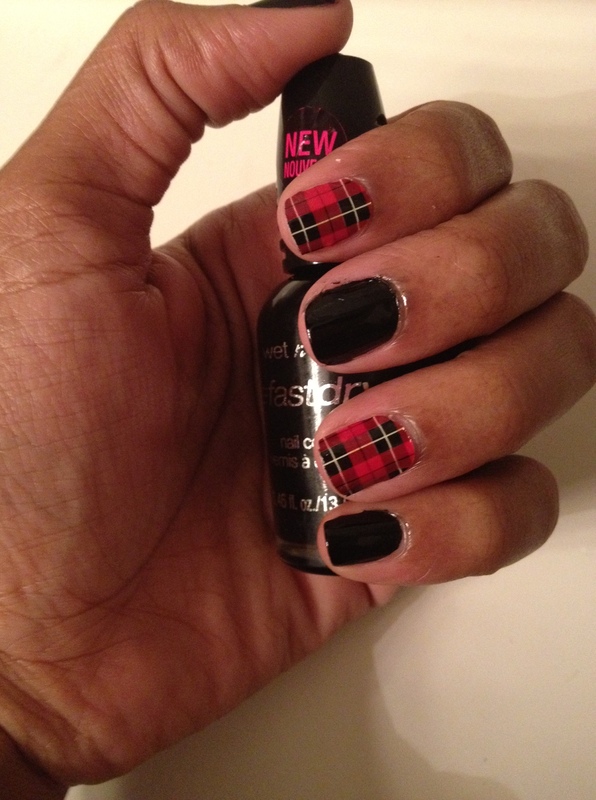 I love plaid so I am loving these! Thanks! I got these in the January My Shade of Brown Pillow Box!